By Bryan Nemeth, P.E., PTOE, Bolton & Menk, Inc.
Modern roundabouts are becoming more commonplace throughout Minnesota, and for good reason. Roundabouts move traffic through intersections with less delay and increased safety due to low vehicle speeds and less conflict angles. Roundabouts maintain mobility at all times of the day. While modern roundabouts can provide many benefits over traditional signal or stop sign controlled intersections, they require significant right-of-way at the intersection location. Additionally, the cost of roundabouts can be high and may not be beneficial where traffic volumes are low. The next evolution of the modern roundabout is applying it on a smaller scale at compact urban intersections. The mini-roundabout concept is being implemented in Europe, Australia, and the United States. The first mini-roundabout in Minnesota is anticipated to be constructed in Shakopee this year. So what is a mini-roundabout? A mini-roundabout is a smaller form of a modern roundabout. It is an intersection option where available right-of-way is limited or where the traffic volume does not warrant the cost of a modern roundabout. Safety and operational improvements of a circular intersection are maintained with a mini-roundabout. A mini-roundabout has an inscribed circular diameter of less than 90 feet with a center island that is sized appropriately for the location, design, and traffic composition. 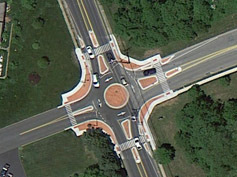 The center island is painted or may be of another material, but is raised when compared to the rest of the intersection. The center island is fully mountable and the splitter islands may or may not be mountable depending on the traffic composition and roundabout size. The same roundabout traffic rules apply, such as yielding to circulating traffic moving in a counter-clockwise direction. Due to the smaller diameter of the mini-roundabout, larger vehicles that are not able to turn within the lanes of the roundabout, such as buses, trucks, or vehicles pulling trailers, traverse across the center island to make their movements. This essentially results in the roundabout operating as an all-way stop controlled intersection while they move through. Consequently, mini-roundabouts are most applicable where truck traffic is low. Many mini-roundabouts under consideration today are large enough to accommodate buses within the travel lanes. A mini-roundabout can be considered as an intersection replacement to all-way stop and some thru-stop and signal controlled intersections, where space is constrained and approach speeds are 35 mph or less. 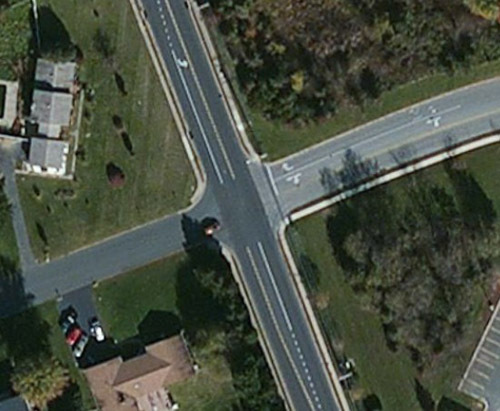 The typical cost of a mini-roundabout conversion is $80,000 to $120,000. A mini-roundabout can essentially be fit within the general area of a traditional intersection (see Figures 1 and 2). A mini-roundabout can also be designed to accommodate existing drainage structures. Typical entering traffic volume is under 10,000 vehicles per day, but mini-roundabouts have been shown to operate effectively up to 15,000 vehicles per day. 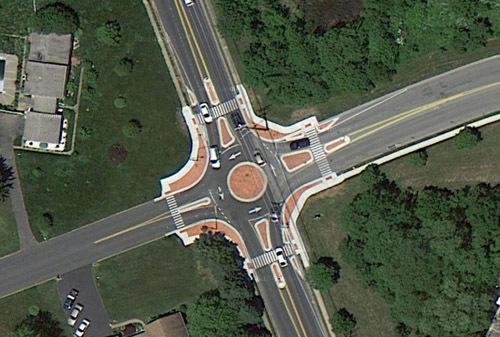 Mini-roundabouts are another tool in the toolbox for improving intersection safety and reducing delay. They can be applied in almost any location where traffic volumes and speeds are low. They provide substantial safety benefits at a low cost implementation. Mini-roundabouts are an innovative traffic concept that should be considered at small intersections. Bryan Nemeth, P.E., PTOE, is with Bolton & Menk, Inc.